We cannot stress enough how important it is to keep a file backup when the likes of Crypto Ransomware are on the loose. 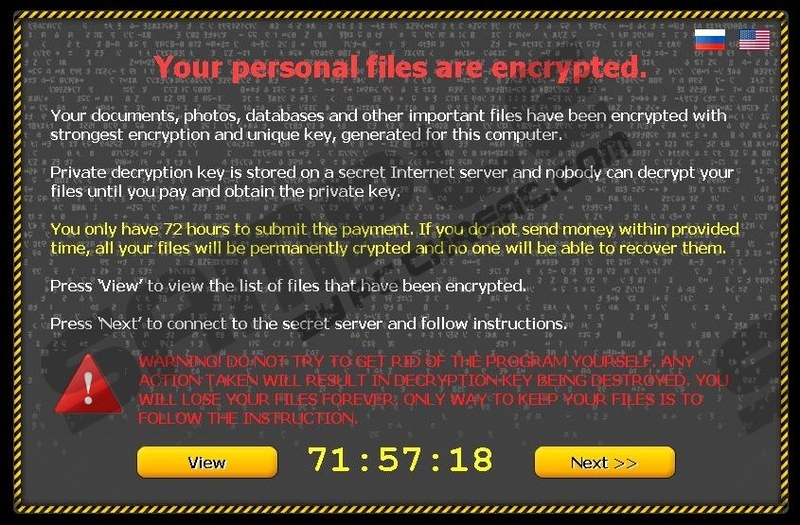 It is a ransomware infection that encrypts almost all of your files and then demands payment for the unique decryption key. Unfortunately, we cannot guarantee that paying would solve the problem. What is clear is that you must remove Crypto Ransomware payload file and everything else related to the infection immediately; otherwise there is a chance that the infection will regenerate or that you will be infected with something else entirely. Our security research team labels Crypto Ransomware as Trojan because a Trojan file is the key point in this scam. There are two stages of this ransomware infection. The first one may seem like your average adware infection because the payload file which later on downloads Crypto Ransomware gets distributed via fake Adobe Flash player update pop-ups. To put it simply, if you click a random link that offers you to download a new flash player (if it is not official); you obviously risk being infected with Crypto Ransomware. You need to avoid such links as much as possible because it is really tricky to remove Crypto Ransomware for good. Your personal files are encrypted. WARNING! DO NOT TRY TO GET RID OF THE PROGRAM YOURSELF. ANY ACTION TAKEN WILL RESULT IN DECRYPTION KEY BEING DESTROYED. YOU WILL LOSE YOUR FILES FOREVER, ONLY WAY TO KEEP YOUR FILES IS TO FOLLOW THE INSTRUCTION. In other words, Crypto Ransomware gives you 72 hours to pay 24 USD or exchange your Bitcoins (if you have any) in order to purchase the file decryption key. However, our security research team says that there is no guarantee that Crypto Ransomware will restore your files. Judging from the previous ransomware behavior, like CryptorBit, for example, it is very likely that your files will remain encrypted. It is very unfortunate that there is practically no way to restore your files, but it just proves the necessity of file backup, whether in your external HDD or on a cloud drive. What is more, you obviously have to remove Crypto Ransomware and all the related files from your computer because you cannot risk the payload Trojan downloading any other infection onto your computer. Do not think that everything goes back to normal just because the notification disappears once you restart the PC. Needless to say, that manual Trojan or ransomware removal is a highly challenging task, and average computer users can hardly accomplish that. Hence, in order to terminate Crypto Ransomware once and for all, you should acquire a legitimate computer security tool. Run a full system scan with an antispyware tool of choice to detect all the malicious files and registry entries. Once you have a list, delete these files immediately and safeguard your computer against similar infections in the future. Quick & tested solution for Crypto Ransomware removal.